Area : 800 sq. km ( with a core area of 498 sq km). Established : 1958 as a sanctuary, 1979 as a tiger reserve, 1982 as a national park. The Sariska Palace is located just outside Sariska National Park and is located at a distance of 190-kms from Delhi and 130-kms from Jaipur, in Rajasthan. The Sariska Tiger Haven neighbours the Sariska National Park and is located 190-kms from Delhi and 130-kms from Jaipur, in Rajasthan. The Aravali hills rise from the desert landscape, lush with forests filling the deep, quiet valleys. Thousands of years ago, the Buddhists found solace here in their monasteries. The Alwar Bagh is built in a heritage style amidst the lush green and pollution free atmosphere. Surrounded by the picturesque Aravalli Mountains, the Alwar Bagh is well equipped with all modern amenities and comforts for the guests. Set in 6.5 acres of lush green landscaping, Gulmohar Sariska Resort is located in the beautiful valley of Viratnagar & surrounded by Aravali Hills. It is an ideal holiday destination, tastefully designed in harmony with the peaceful surrounding offers a perfect setting to commune with nature. 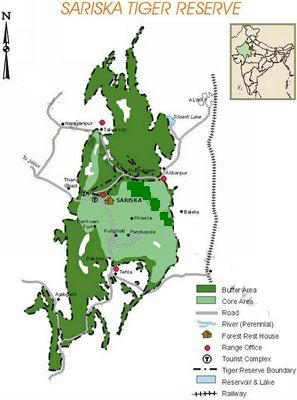 Sariska Tiger Reserve, as the name elaborate, it is a tiger reserve and tiger is the flagship species of the reserve. Other major animals found in the pare are Bengal tiger, leopard, jungle cat, wild boar, four horned deer, hyena, sambar, gaur, jackal, langur, caracal, jackal, nilgai, hare, fox and etc. It is also home to several major birds includes the kingfishers, golden-backed woodpeckers, vultures, gray partridges, peafowl, one horned owls, tree pies, sand grouses, crested serpent eagles, white-breasted, quails and etc. Location: 107 Kms. from Jaipur, in Alwar District, Rajasthan. Time to Visti: October to June is the best time to visit the national park. Airport: Nearest airport is Jaipur (Sanganer Airport), which is only 110 Kms away. from Sariska. Railway Station	: Nearest railway station is Alwar, only 36 Kms away from Sariska.